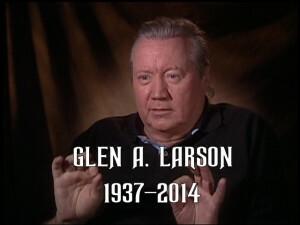 Glen A. Larson, the legendary Hollywood writer-producer and creator of Knight Rider, has passed away. He was 77. Born Glen Albert Larson on January 3, 1937, his parents moved the family to Los Angeles while he was still an infant. These were the days before television, and a love of the art of storytelling was germinated while listening to hour after hour of popular radio shows. This love of the entertainment industry led him to pursue a job as a page at NBC, then back home to watch such live anthologies as Lux Video Theatre and Matinee Theatre on the fledgling medium of television. In 1956, while still attending Hollywood High School, Larson and his group The Four Preps were signed to a long-term contract by Capitol Records. Along with bandmates Bruce Belland, Ed Cobb and Marv Ingram, Larson recorded such hits as Twenty Six Miles (Santa Catalina), Big Man and Dreamy Eyes. The group are cited as a major influence for the later Beach Boys. The Four Preps were enormously successful over the next ten years, and appeared on The Adventures of Ozzie & Harriet, Gidget, The Ed Sullivan Show and American Bandstand; they played college campuses around the country and toured the world. But Larson’s personal life now included a new wife and child and he wanted to get off the road, so he pursued a career in television and sold a story idea for a 1966 episode of The Fugitive entitled In a Plain Paper Wrapper. The shooting script was co-written with Jackson Gillis, a veteran TV writer who would go on to write two episodes of Knight Rider (Blind Spot and Hills of Fire). The episode guest-starred Lois Nettleton, Michael Strong, and a young Kurt Russell. That script proved to be a major turning point in Larson’s career; soon afterwards he sold another script to the Robert Wagner-starring hit It Takes a Thief. He had found his calling: In the span of that same season, he joined the writing staff, became a Story Editor and then Producer of the series. A result of this unprecedented success saw an offer of a production deal with Universal Studios. Larson signed and never looked back. Over the next ten years he was enormously successful, working on McCloud, The Virginian and The Hardy Boys/Nancy Drew Mysteries. He also began a run of creating a huge number of classic hit shows that endure to this day, including Alias Smith and Jones, Switch, Quincy, ME, BJ and the Bear, Buck Rogers in the 25th Century and the iconic Battlestar Galactica. He was also instrumental in shaping The Six-Million Dollar Man, his first collaboration with Lee Majors. The 1980s were not quite so prolific, but provided Larson’s resume with some of his greatest, most enduring hits. In 1980 he helped rework Donald Bellisario’s Magnum, PI pilot script (Don’t Eat the Snow in Hawaii), and the co-production between Glen Larson Productions and Bellisarius went on to become one of the biggest hits of the ’80s. For Twentieth Century Fox Television Larson created, wrote and produced The Fall Guy, his second collaboration with Lee Majors and one of his personal favourites of all his shows. It was at this point he was approached by Universal to complete his production deal – he owed them one last show, and they had an idea about a show based around a talking car. Because the deadline for pilot season was fast approaching there wasn’t time to produce an entire TV movie. The decision was made to produce a network presentation comprised of several key scenes from Larson’s script. Larson called in favours all around Hollywood to cast it according to his philosophy of making a fantasy premise believable: Edward Mulhare, Richard Basehart, Richard Anderson, Vince Edwards, Lance LeGault, Bill McKinney, Dennis Fimple… all reliable character actors and stars he had worked with many times before who would considerably raise the profile of the pilot. “This was network proof,” he said. Under contract as the Executive Producer and showrunner of The Fall Guy at Twentieth Century Fox, Larson left Knight Rider in the capable hands of R.A. Cinader, Steven E. de Souza and Hannah Shearer. “I tried to stay with things until I thought they were on their feet and they learned to walk and talk,” he said. The show went on to ride out four successful seasons, and made a superstar of David Hasselhoff. “I’m David Hasselhoff, and I was ‘created by Glen Larson,'” David Hasselhoff said in the Knight Rider DVD commentary, a fitting tribute. After Knight Rider, Larson created and executive-produced Automan, Manimal and Cover-Up while still working on The Fall Guy. He famously brought his musical talent to the shows he created, composing the distinctive theme tunes to many including Hardy Boys/Nancy Drew Mysteries, BJ and the Bear, The Misadventures of Sheriff Lobo, Buck Rogers in the 25th Century, The Fall Guy, Battlestar Galactica and Knight Rider. The late 1990s saw the beginning of a revival of these classic shows, as the generations raised on them came of age. 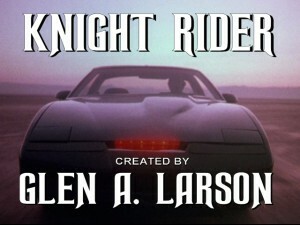 Knight Rider had already spawned a made-for-TV reunion in 1991 (Knight Rider 2000), and received a sequel series in 1997 (Team Knight Rider) and a 2008 reboot. 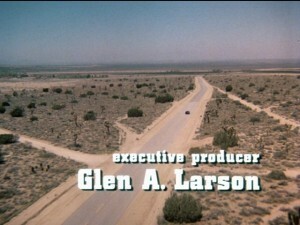 The 2000s saw the movie rights to these properties being snapped up once again by the studios: The Fall Guy, Magnum, PI, Manimal, Battlestar Galactica and, of course, Knight Rider are all in development for the big screen treatment ensuring that the name Glen A. Larson will endure for a very long time to come. This entry was posted in Knight Rider, Obituary, Production Staff and tagged Bill McKinney, David Hasselhoff, Dennis Fimple, Edward Mulhare, Glen A. Larson, Lance LeGault, obituary, R.A. Cinader, Richard Anderson, Richard Basehart, Steven E. de Souza, Vince Edwards. Bookmark the permalink.